The latest Oscar-nommed film Precocious Daughter and I saw is Philomena. If you're a devout Catholic, spoiler alert: Evil nuns. is going to be a good egg. Philomena is the based-on-a-true-story story of Irishwoman Philomena Lee, who had a child out of wedlock in the early 1950s, only to watch helplessly as the convent that took her allowed her son to be adopted away from her. A disgraced journalist agrees to help her find her son, and they embark on an odd-couple road trip in search of answers and a good story. It's a fairly slim tale, but wonderfully written and acted by Steve Coogan. Along with Will Forte in Nebraska, Coogan has proven this year that comedians can actually be fine dramatic actors. He more than holds his own with Judi Dench, who is typically impressive as the title character. I'll tell you the truth: I think Coogan probably should have gotten an acting nod rather than Dench. He's that good. Overall, the film is not more than a couple of steps above a made-for-TV movie. I enjoyed it a lot, but at its heart it's a small, intimate story blown up to fit the big screen. And I think the only way to truly enjoy it is if (like PDaughter and I) you go in unaware of the details of the actual events. The plot twists are satisfying and dramatic, but only if you don't see them coming (and honestly, I figured out what was coming pretty early on). 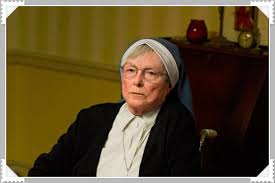 There has been talk of the dramatic license taken with the facts, especially from Catholics who believe the nuns are falsely portrayed in a negative light. But as an ex-Catholic myself, I say evil nuns make great drama, so bring on the license. I really recommend Philomena as a rental or Netflix-queue film. You'll enjoy it, I think. Forget the Oscar nomination, and enjoy Dame Judi Dench explaining what a "beard" is. I first heard about Philomena in an interview with Coogan in which he talked about how intimidating it was working with Dame Judi Dench. It doesn't surprise me that he said she would disappear into the character so he'd forget who she was during a scene, only to become flustered again when they broke character and he remembered who he was working with. She's always seemed wonderful and formidable. It's a good thing she didn't become a nun. 12 years of Catholic school. Adequate experience with evil nuns. Don't need any more. Next. I went to a progressive Catholic HS in the 70s, where all the nuns were awesome Social Justice types. And even the older nuns I have known were wonderful. But I also know my history, so I can believe that it's a true story. And if you have ever seen Dame Judi on a talk show, she is a hoot!